Week 35. This week, I multi-tasked. I went through bins in the basement, organized and purged. I took all of Lo's clothes out of her old dresser and closet and put them away in her new room. I washed all the un-washed baby clothes and put all the tiniest newborn-sized clothes into Lo's old, now empty dresser. I crossed things off lists. And made new lists. I opened the official first pack of diapers, put them into the drawer and marveled at how tiny they are. And breathed in that familiar clean-diaper smell. I made cake pops to freeze and tulle puff decorations for a certain little girl's birthday party. I shopped around for the best deals on pink party supplies. I went to my weekly doc appointment and found out I had actually lost a few pounds this week. Probably from all of the shopping for pink party supplies – ha. I played drums on our mini kid-sized drum kit while Bo played guitar and Lo hula-hooped. I located all of our old 'baby's first year' books (that had been hiding in all sorts of random places in our house.) I watched 'Never Say Never,' the Justin Bieber movie, in its entirety on Netflix late one night. Mixed in with a little 'United States of Tara' and the usual 'My So-Called Life' and a Charles and Ray Eames documentary. 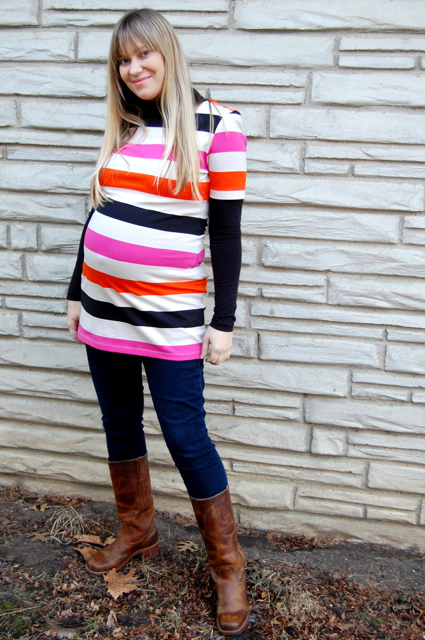 I ended up scheduling Lo's annual 5-year check-up on my actual due date with baby #2. That's how close their birthdays could be. And the nurse figured, 'Hey, you can probably just bring Lo in for her appointment and also probably do the whole newborn check-up with your new baby at the same time.' (Wow. I guess. Okay?) Anyway. I'm on a productivity streak. Let's go. You look so good, Jen!! I love that top on you. 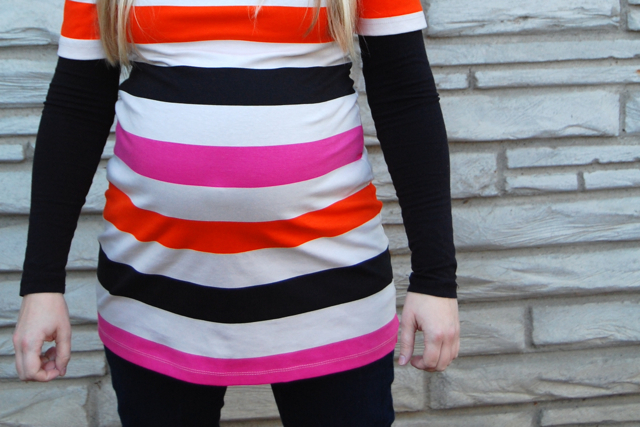 Who says pregnant gals can't wear horizontal stripes, right? Love it. I just bought diapers this week, too, and somehow it's so easy to forget how little they are, hey? You rock! And you are gorgeous- rad outfit! Also, the idea of Lo hula-hooping white the fam jams is just the coolest thing ever. You guys rule. 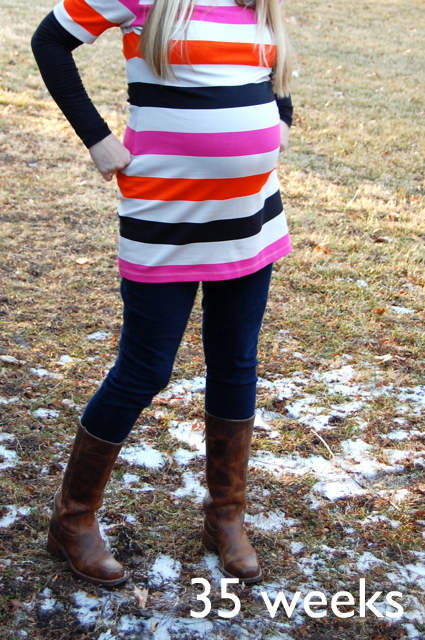 You are such a cute prego!! and such a busy girl! love your boots to by the way! super cute! and i love that outfit. Esp. the boots.